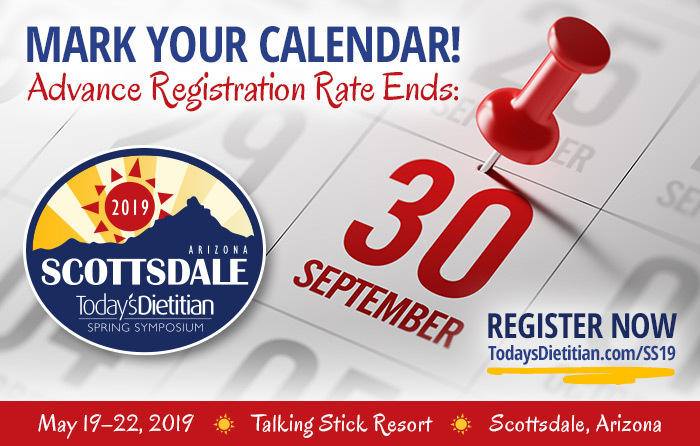 Don't miss the opportunity to enjoy our Advance Registration Rate of $199 for the 2019 Today's Dietitian Spring Symposium, May 19–22, 2019, at the Talking Stick Resort in Scottsdale, Arizona! This low rate is valid only through Saturday, September 30, 2018. Our 6th annual continuing education and networking event for dietitians and nutrition professionals will feature a diverse program of sessions and workshops offering more than 15 CEUs, plus a variety of opportunities to interact and network with fellow RDs in attendance. We invite you to expand your nutrition expertise and professional development by joining us in this picturesque location this coming spring! Join us in The Valley of the Sun and experience what we have in store for this year's event!